This section allows you to express views, opinions and visions in writing. Unlike applications, letters are not examined under the official procedure. Your official request or application to the Government is henceforth subject to transparent procedures. Our website informs you as to which agency or official is currently in charge of your hand-delivered or mailed request or application. www.e-gov.am website brings together all e-government tools and data bases created by RA State agencies and provides a user-friendly online environment. RA Prime Minister Tigran Sargsyan took part in the inauguration of the bust of outstanding Armenian statesman, minister of interior in the first Armenian republic Aram Manukyan close to the chief entrance of the building of RA Police headquarters. 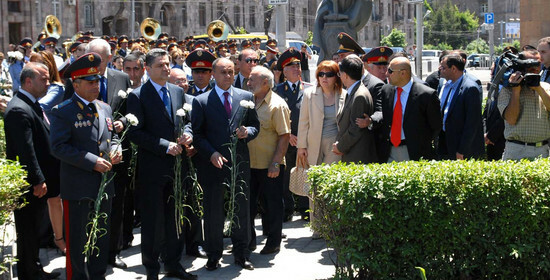 The bust was unveiled by Prime Minister Tigran Sargsyan and Head of Police, Major-General Alik Sargsyan. © 2004 - 2019, Copyright. The photos placed on this website are copyright protected by the Author and Adjacent Rights Law of the Republic of Armenia. It is strictly forbidden to copy, misuse, spread, exemplify, adjust the photos or use them for any other purposes before prior written permission of the Office of the Prime Minister of the Republic of Armenia.